Have been using my 7D for quite some time with ML without any serous hiccups, have lent it to coworker many times as well, no problems. *) formated on computer, on 40D, made sure that it is clean with eoscard, and even without card. and all combinations of above - camera seams to be dead. One think I could think off, it froze while using alternative battery, that sometimes had acted up, like on charger it is full, in camera show empty, but works like it had been full. Insert power adapter. Startup cam. Insert card, insert power adapter, close compartment doors. Do not turn on cam's power switch. same, just the front led blinking. did tests without grip, now also with. The portable display test does not attempt to blink the LED at all. What do you mean by "front led" btw? ML only uses the card LED (when loading normally, not from display test, the card LED is turned on as soon as the camera model is recognized), and on some cameras, the blue DirectPrint LED (but only when main firmware is up and running; never from bootloader). Nothing else in any combination, including portable display test, have no reaction except, when camera is powered by external power adapter it blinks the front led. This reminds me of the very short time the camera stays on if the communication between two digic cores is unsuccessful. Here's a LED blinking test for 7D: autoexec.bin. Only tested in QEMU. Walter, can you confirm it's blinking on your 7D? No, not working. Top LCD working, wheels acting normal, rest does not react at all. I saw somewhere topic about this. Can this be a result of camera overheating. 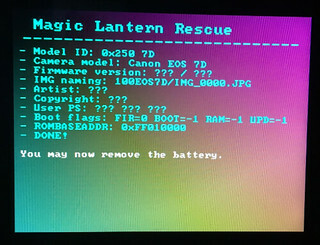 I'm just speculating here of probable scenario, as this happened when person I lent camera to switched it off, took card out copied pictures and then inserted it back in and camera did not turn on, he called me and I instructed do the battery removal, and start without card, it did not help. Maybe camera got stuck without card, overheated... just speculating. On Wednesday I'll have chance to bring it to repair shop. Did a fresh install with nightlies (2016Jul09) and replaced the recent binary that @a1ex uploaded which then made the screen go black as soon as I turned it back on after restart. I then take the battery out and pop it back in and that's when I notice a single LED blink. Is this what you're looking for? Still unable to use the Canon or ML menu unless I take the card out. In order for the 7D to become responsive I had to replace the autoexec.bin back to the original from nightlies and ML is back to normal. That single LED blink, if consistent, is better than nothing. @DeafEyeJedi or @Walter: with normal ML, when the camera is off, if you remove the lens and put it back, does the LED blink? Same question using the blinking autoexec from above. 7D and I will meet again in the evening. Maybe DeafEyeJedi will give it a try. Just tried taking the lens off and back on to no blink whatsoever. Did this with three different Canon lenses just to be sure. Are we looking for a constant flash (like a long pause while lit) or a rapid quick flash? Can this so called "LED blink" only occur once after each fresh install of ML? Because I only saw it flashed once when I changed from 24 pancake to 40 pancake but then when took it out again and swap it back which didn't produce anymore blinks afterwards. Should I try to do another fresh install just to be sure that I didn't miss anything in the first place? All other cameras should blink when you do this lens trick, with a ML card inside, so you can check what blink to expect. From the current reports, I guess the 7D blinks once at power on, then locks up. Here's a full-featured autoexec for 7D that should blink when changing the lens with the camera off, just like all other cameras: autoexec.bin. It's compiled without modules, so you can just paste it over an old ML installation. Okay just did another run with your autoexec.bin from recent post above. Funny thing is now it doesn't blink at all when changing lenses and yet I haven't had it locked up either. Been trying to get it bricked or at least an opportunity for me to need to take the battery out. I'll try to emulate the bootloaders in QEMU, maybe I'll figure out what it expects. At this point, I'm kinda stuck. Is this the latest PDT autoexec.bin? Doesn't the latest one backup ROM0 and ROM1?